En ce triste jour, comment ne pas penser à Eugène Canseliet, alias Fulcanelli, auteur du fameux livre « Le mystère des Cathédrales » dédié en partie à Notre-Dame de Paris ? Canseliet, professeur au CNAM, était le grand spécialiste français du palladium. I am sad for the loss of France and for the damage done to such a great cultural monument. And, of course, this is not only a blow for France, but also for the rest of the world. Luckily, my younger son and his girlfriend were visiting Notre Dame in the afternoon when the fire started. They were evacuated but did not know there was a fire - it was almost closing time and they just thought the staff wanted to leave earlier. There was no sign of fire inside at this time. I'm sure there is enough love and money to rebuild the cathedral almost exactly as it was, although some paintings are lost forever. However, like the Pheonix, she will rise again and be glorious. Nous sommes tres desole ca catastrophe! Given their height, cathedrals are remarkably resilient buildings, being based on tensegrity principles. 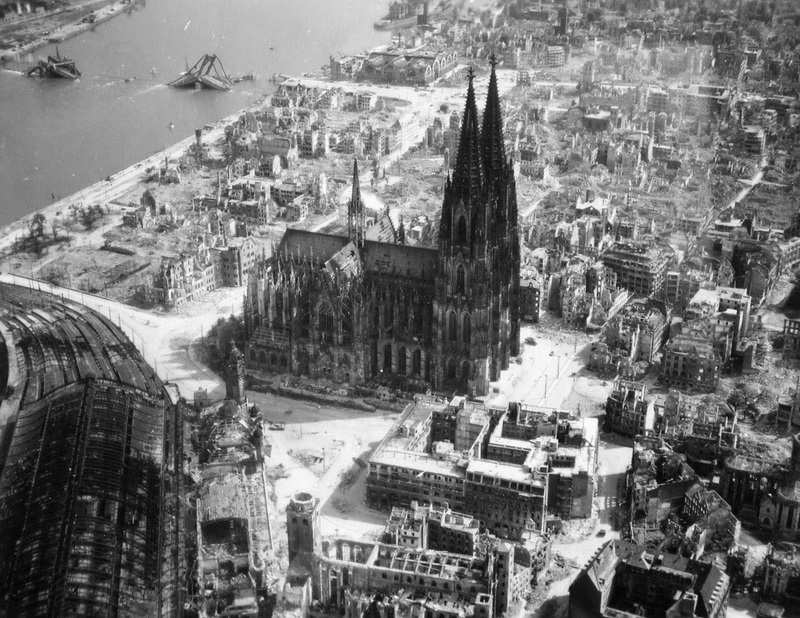 The Cologne Cathedral stands amidst the ruins of the city after Allied bombings (1944). The cathedral suffered fourteen direct hits by aerial bombs during the war but did not collapse. The arch pre-dates tensegral design by at least two thousand years. Which is handy, as it’s rarely a wise move to subject masonry to tensile loads. A gravity dam would be a more apt comparison IMO. And not wishing to downplay the cultural tradegy, but York Minster burnt down 30 years ago, and apparently the repair bill was 2.25 million quid. (The minster is larger, but less tall). I read that two rich Frenchmen have already pledged 500 million euros each, which I imagine should cover things. Even accounting for Catholic tastes. 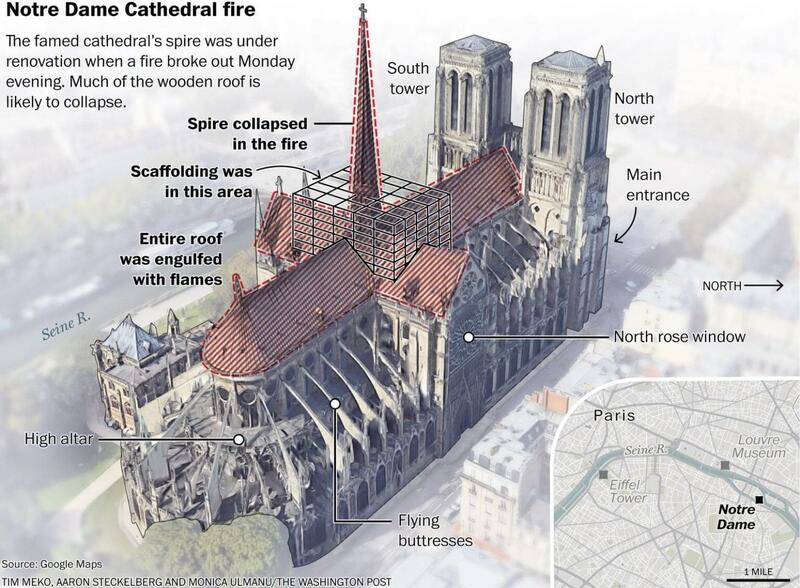 IMO it's evident, that everything what could burn at the roof of Notre Dame did actually burn or it has fallen down. Neither fire prevention systems, neither equipment of Paris firemen were prepared to this situation. I also don't believe any assurances about "accidental origin" of the fire - the more, they were issued suspiciously fast without any investigation. Once someone says something like this, he must by lying - or he knows actual party at fault. The cathedral is wondrous and lovely and of course should be restored. But I think some wealthy people and a wealthy church need to remember about all the poor and diseased and famined in the world who need help much more than they need a cathedral in Paris. Fair point Zephir, I didn’t realise how minimal the damage to York Minster was compared to Notre Dame. Although it’s interesting to compare some artist’s impressions of the fire with the aerial photos of the actual damage. I read that they have a 1 mm scale laser scan from more than 50 locations in the building, so they know exactly what it looked like. I expect they will use modern materials in the upper parts hidden from public view. This will be much more fireproof and it will last longer. Buildings like this have to be reconstructed periodically. This was overdue for a complete reconstruction. Some of building is not particularly old. The spire was from the 19th century and many of the windows were from the 1960s. I know this sounds strange, but it was not such a tragedy, because it can be reconstructed. Recent events such as the Brazil National Museum fire were FAR worse. I have some knowledge of fine arts, and fine art curating. My wife wrote a book about it. When she was doing research, we spent time with curators in the workshops at the Metropolitan Museum of Art and the Cincinnati Mus. of Art. Plus I have read various books about it . . . Anyway, years ago in a book about this, a curator wrote that what you see in a museum is a reconstruction. If they showed the works as they really are, you would see ruins. You would see fragments. This was illustrated with famous paintings in the workshop being repaired. Faces are missing. There are tears in the canvas. Entire sections have been torn out and lost. Along the same lines, all of the machines in the Smithsonian have been extensively rebuilt. The Wright Flyer has new canvas on the wings. The original canvas is preserved. A square inch of it was taken to moon by Neil Armstrong, who was a big fan of the Wrights. A painting by El Greco in the Met looks as if it was painted a year ago, because it has been meticulously cleaned and restored. If you could see it as it was in the workshop, it would look 400 years old. The curators are incredibly skillful and careful. Whenever possible, they make repairs that can be undone by a future curator. They document everything. To the best of their knowledge, they make the art look the way it did when it was created. With one major exception: they do not paint ancient Greek sculpture, even though they can detect the colors it was originally painted. People since 17th century have gotten the idea that Greek sculptures were bare marble. Michelangelo and others since then created all of their work intending it to be bare, unpainted marble. 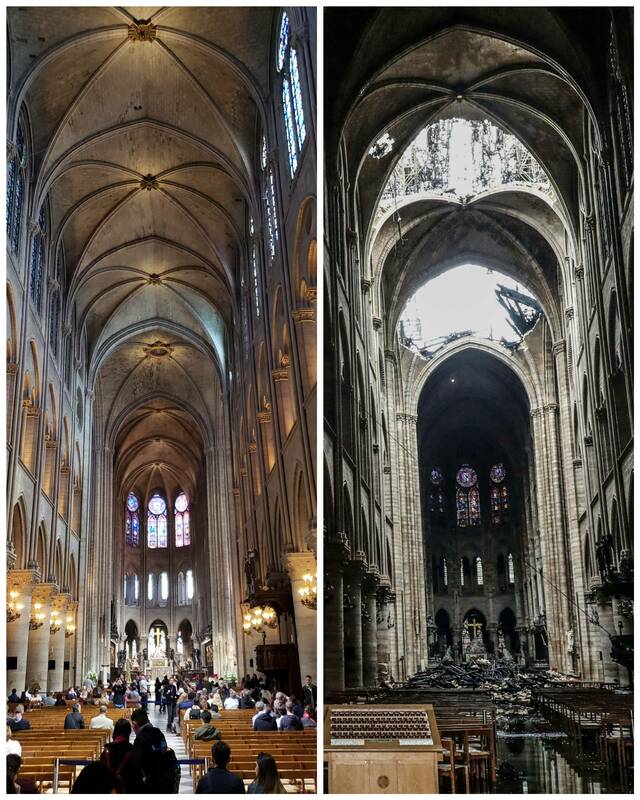 The Notre Dame cathedral has been repaired many times. It would be a pile of stones otherwise. It has been changed. After it is restored this time, I doubt the appearance will be changed again in the future. But if it survives for thousands of years more, I am sure it will have to be disassembled, repaired and put back together many times, the way the White House was. Like many problems, including LENR, the technical part is the easiest and predictable. For me it was and it will be the symptom of what is happening to France. Maybe that is the core of the shock. Hopefully there is only one severe wounded. Knowing that the only EPR reactors in production are in China, I understand they feel that affair is important to analyze. Perhaps Notre Dame will outlive EPR. It's complicated, and full of manipulations like we see on LENR.